Sunday 21st January 2018 will see the latest exciting event to celebrate 'The Prisoner' 50th anniversary. The iconic Elstree Studios, across the road from the former site of MGM where the series was filmed, will play host to an event organised by The Unmutual Website and Quoit Media Limited. The event will include several special guests, on-stage Q&A sessions, screenings, attractions, and is only £20 per person to attend. The event starts at 7.00pm and profits will be donated to Ty Gobaith Children's Hospice in North Wales. With not long to go until the event, and with tickets in very limited number, it is advisable to purchase your tickets as soon as possible, direct from the Quoit Media website HERE. Guests will be announced shortly. 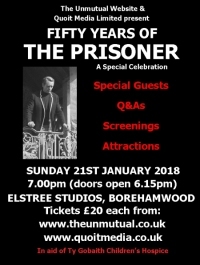 Earlier that afternoon, Dave Lally will conduct a walking tour of film, TV, and 'The Prisoner' locations in the area, starting at 2.00pm at Elstree and Borehamwood station (details HERE).